When most people think of drug abuse, they think of abusing prescription or illegal drugs. However, even drugs that you can buy over the counter can be addictive. Over the counter drugs are medicines that don’t require a prescription. Some nonprescription drugs include cough medicine and sleep aids. h so many different types of drugs out there, why do so many people abuse over the counter drugs? To understand why you first have to take a look at the average age of people who use nonprescription drugs. Studies show that teens and young adults are the most likely to abuse them. Teens abuse these drugs because they can’t afford illegal drugs and can’t get their hands on prescriptions. Over the counter drugs are also easy to find at home. Most people don’t keep nonprescription drugs under lock and key. Since they’re so easy to obtain, they’re the prime target for young adults who want to get high. Of course, it’s not just teens who abuse these drugs. Nonprescription drugs are a favorite among people with low incomes. These individuals can usually afford medicines such as cough syrup. So when worst comes to worst, they turn to those for a quick fix. Some people mistakenly believe that over the counter drugs aren’t dangerous. However, they’re often more dangerous because of the large amounts that teens have to take to get high. People typically end up overdosing before they achieve the high that they want. Dextromethorphan (DXM) is a popular nonprescription drug that people abuse. It’s the active ingredient in cough syrups such as Nyquil and Robitussin. The drug helps suppress the area of the brain that’s responsible for coughing. In normal amounts, the drug works great. In large amounts, however, it causes psychoactive effects. Some of the problems that occur when taking large amounts of DXM include dizziness, vomiting, and hallucinations. Continued use of DXM can result in severe life-threatening conditions, such as seizures and other mental disorders. It’s important to get help for this kind of abuse as quickly as possible. Ephedrine is a drug in many diet pills, and it’s harmful to the central nervous system. 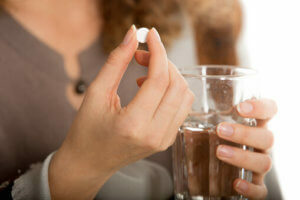 The drug acts as a stimulant that helps boost weight loss. Unfortunately, it also causes other health problems. People who abuse ephedrine experience high blood pressure and increased heart rate. They’re at a great risk of developing heart disease and suffering heart attacks. In fact, the FDA banned this drug in 2004. Unfortunately, people can still get their hands on it at many stores that sell older products. We offer unique holistic therapies on site. Some of these therapies include massage therapy, acupuncture, and chiropractic adjustment. All of these services are available in our wellness center, which is free for our clients to use. Get the support and help that you need from 1st Step Behavioral Health. Learn the difference between a rehab center that uses a proven approach to treatment and one that doesn’t. Contact us today at 866-319-6123.